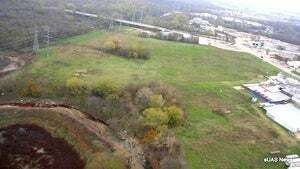 A Dallas drone hobbyist was flying his rig around one bright Texan afternoon, scouting the skies, when he hovered across something perturbing: an enormous, oozing river of blood behind a meatpacking plant. That's gross and illegal! Here come the cops.